As with my post on the Red Eared Slider here you will find some basic information on the Painted Turtle. While researching the painted turtle you will find that there are several species found in North America. Some of which will include the Southern Painted Turtle, Western Painted Turtle, Eastern Painted Turtle and the Midland Painted Turtle. Obviously the names indicate in which region they are found but there will be some differences in the way you care for each turtle species. Always remember that if you feel that you can not find the answer to your turtle questions on this site or any other web site, check with your veterinarian or your local reptile specialist. The painted turtle by some estimates is the second most popular pet turtle after the red eared slider. 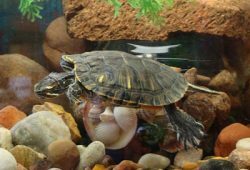 If you are thinking about keeping a painted turtle know that some states have laws that forbid individuals from keeping them as pets, so make sure to check the laws in your area. 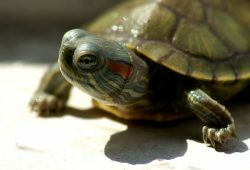 Keeping a Painted Turtle is similar to that of a red eared slider. However some keepers have characterized the painted turtle as not being suitable for children as they do not like being handled, while others have voiced that they can be very tame in captivity. As with any pet that you keep all have there own personalities that you will have to learn. Size: The average adult female painted turtle can range in size from 6-8 inches while the adult male painted turtle is smaller ranging from 5-6 inches. Natural habitats & Enclosures: The painted turtle can be found in Canada, The United States and Mexico. 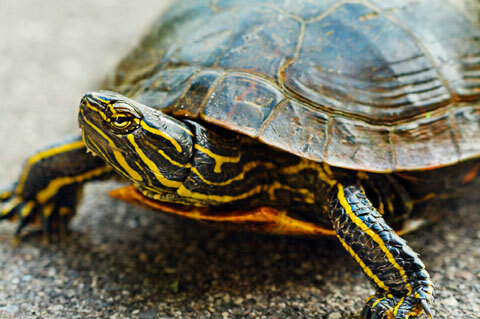 Just as the Red Eared Slider the painted turtle is found in slow moving bodies of water, ponds and swampy areas. For an indoor enclosure, a basic Turtle Tank setup with sufficient space to hold three or four adult painted turtles, if you decide to add more later, will be enough space. A water filtration system, a light with UVB-emitting bulbs and a basking area that provides a temperature range of 75 -90s. Painted Turtles are most comfortable in higher temperatures so often advanced keepers add a submersible heater to raise the water temperature a few extra degrees to maintain the water at a minimum of 75 degrees. These turtles are also different than the red eared slider as they like plant vegetation to roam in which seems to make them feel more secure in their environment. So having live plants in the tank will go a longs ways to keeping your painted turtle happy. Nutrition and Diet: The painted turtle in their natural environment enjoy a diet of fish, tadpoles and crayfish. They also indulge in a wide variety of aquatic plants like watercress, duckweed and other greens. 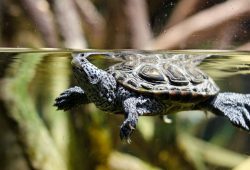 For painted turtles that are kept as pets a successful nutritional diet will include a pellet supplement, greens such as romaine lettuce and duckweed. Cut fish or earth worms will also have to play a crucial role in your turtles dietary needs. Always remember that pet turtles in general are prone to health issues that typically arise from the lack of proper nutrition. So with that in mind remember to keep a varied and balanced diet for your turtle which will help keep your turtle healthy and happy.